Hong Kong, China (CNN) -- Protesters on Wednesday rallied outside Hong Kong's Legislative Council as lawmakers began debate over an electoral reform package that may determine the Chinese territory's political future. Police estimated that both camps of protesters numbered in the hundreds at noontime but said they were prepared for as many as 10,000. At issue: the pace of implementing universal suffrage, or direct elections. Under the reform package, Hong Kong Chief Executive Donald Tsang has said the territory may implement universal suffrage for the election of the Chief Executive in 2017 and for Legislative Council in 2020. "May" is the operative word, said Fred Lam, a member of Post-80s Youth Against Unrightful Authority, one organization protesting the reform plan outside the Legislative Council (LegCo) building. "We think the government or the Beijing government should give a real definition of universal suffrage, a real promise of democracy in 2017 and 2020. It's ambiguous about the date." "There is not a 'must' or a 'will,'" he added, saying that the absence of a "more concrete promise" doesn't lend confidence. Lawmaker Tam Yiu-chung, of the Pro-Beijing party Democratic Alliance for the Betterment and Progress of Hong Kong, called passage of the reform package long-awaited. "Today we pass the resolution. After that, we will study about the functional constituency elections," he said Wednesday, referring to a controversial electoral component. Asked whether they would ever be eliminated, he responded, "It will not be changed." Hong Kong operates under a "one country two systems" policy under Chinese rule. The territory was handed over by Britain to China in 1997, and maintains a legal and administrative system separate from mainland China. The territory's leader -- the chief executive -- is selected by an election committee comprised of people selected by Beijing. Only half of the 60-seat Hong Kong legislature is directly elected. The other half is selected by "functional constituencies" -- groups that are based on professions. The proposals being debated in Hong Kong represent a compromise between Beijing and some democrats in Hong Kong. 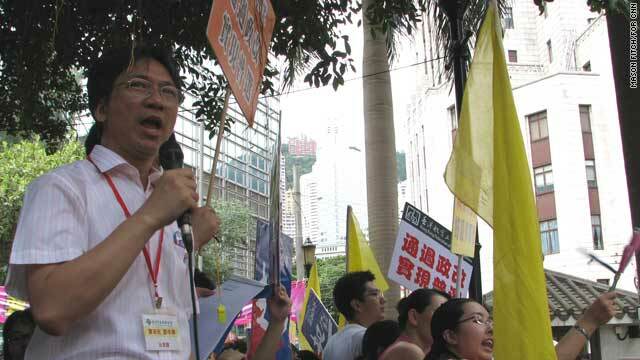 But even pro-democracy activists are divided on the path to universal suffrage in Hong Kong. The reform package offers a "one-person-two votes" proposal, where every voter will vote for their geographical constituency, based on where they live, as well as a functional constituency candidate nominated by elected District Council members. Forty votes -- or a two-thirds majority -- is the threshold needed to pass the reform package. Outside of the Legislative Council building on Wednesday, Daneil Cheung, a leader of the Hong Kong Baptist University Student Union, echoed Fred Lam's skepticism, saying that universal suffrage has in the past been touted for 2007 (for the chief executive) and 2008 (for the Legislative Council). As for the functional constituency systems, Cheung thought they should be abolished. "They are safeguarding their own industry interests," Cheung said, alluding to why members may take a pro-Beijing stance. "Not the interests of Hong Kong." The Civic Party wants to abolish the functional constituency system and says the reform package only preserves it. Leader Audrey Eu on Wednesday said that a last-minute amendment underscored the lack of transparency by the Legislative Council and that the package does not offer a roadmap or timetable for universal suffrage. "The Legislative Council is running roughshod over this," she said inside the LegCo building. Duncan Tai, among the crowd outside the LegCo building supporting the reform package, said he and others weren't "pro-government." "We're pro-ourselves. This is an improvement bill." He said that he wanted to show support for a package that would give him two votes, one more than what he has now, and that it was not the final step. "If the bill is not passed, then we have to start again." Debate was expected to continue through Wednesday and possibly into Thursday.